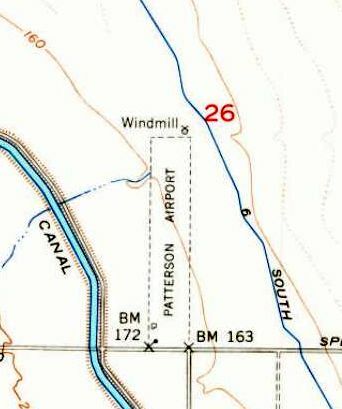 Patterson Airport, as depicted on the August 1948 San Francisco Sectional Chart. which depicted Patterson as having a 2,600' unpaved runway. which depicted Patterson as having a single north/south runway, with a few small buildings on the southwest side. 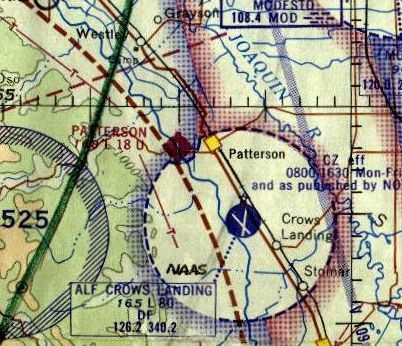 Patterson Airport, as depicted on a 1952 CA Highways map (courtesy of Kevin Walsh). 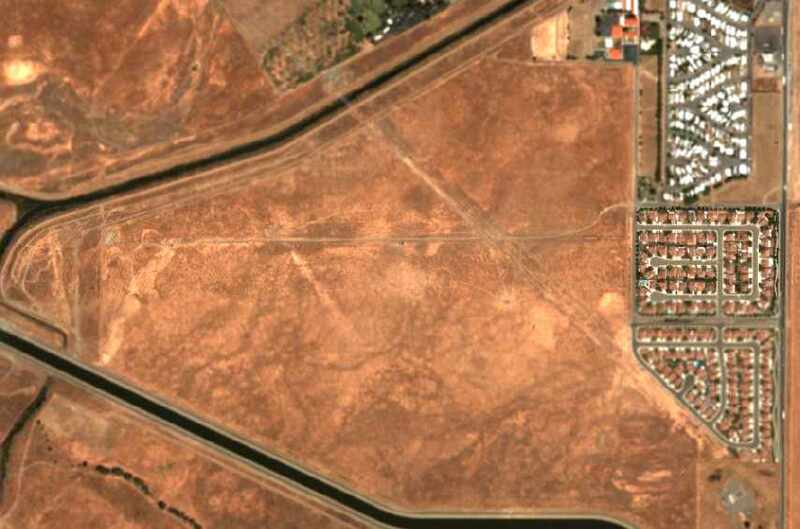 which depicted Patterson as having a single north/south unpaved runway, with 2 small buildings on the southwest side. 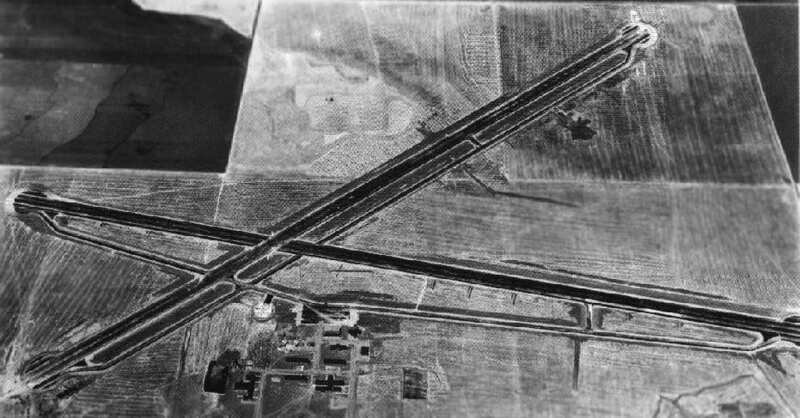 A 1957 aerial view (courtesy of Jonathan Westerling) depicted Patterson as having a single north/south runway, with a few small buildings on the southwest side. 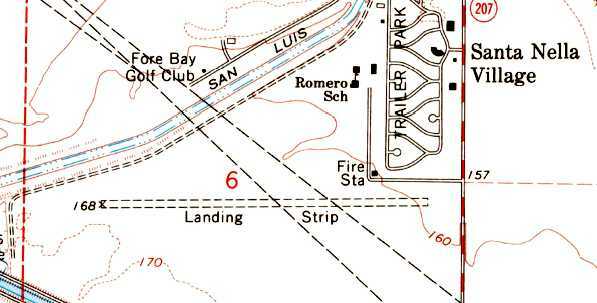 The 1961 San Francisco Sectional Chart described Patterson Airport as having an asphalt runway. The 1965 San Francisco Sectional Chart depicted Patterson Airport as having a single 1,800' paved north/south runway. The 1966 San Francisco Sectional Chart depicted Patterson Airport as having a single 1,800' paved north/south runway. A 1977 airport directory (courtesy of Jonathan Westerling) depicted Patterson as having a single 2,505' paved Runway 16/34, with an office & a few small buildings on the southwest side. 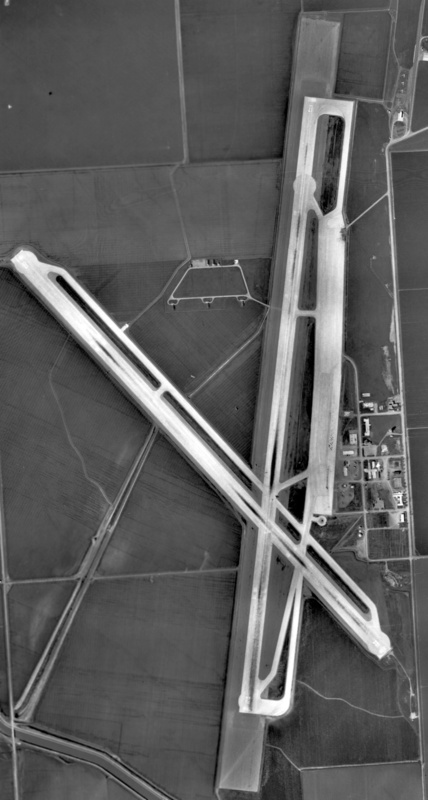 It depicted Patterson Airport as a private airfield having a 2,500' paved north/south runway. 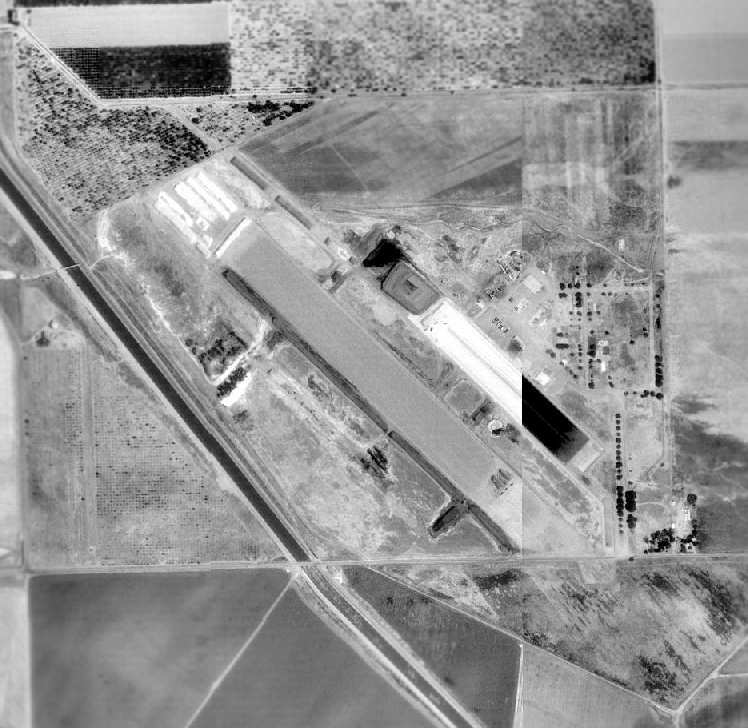 A 1998 aerial view looking northwest depicted Patterson Airport as having a single paved runway. One aircraft was visible parked near the hangars on the southwest side. 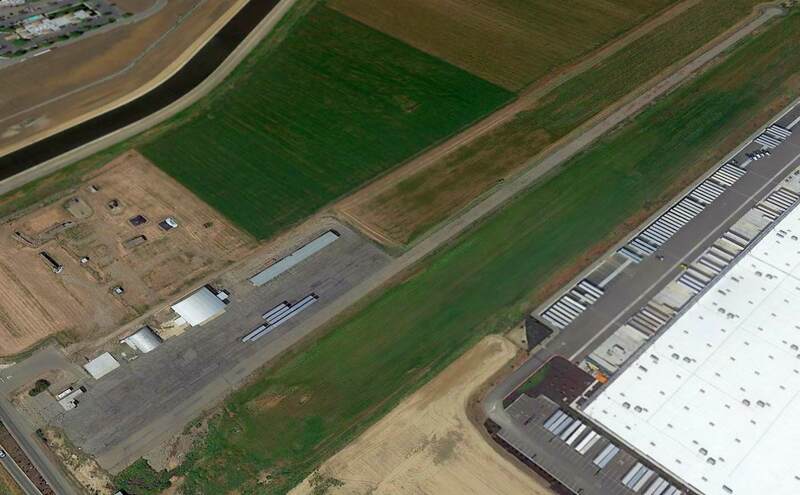 which showed 1 aircraft parked near the hangars on the southwest side. A proposed business park proposed for the Patterson Airport site in 2010, as described in an article (courtesy of Jonathan Westerling), did not get built. 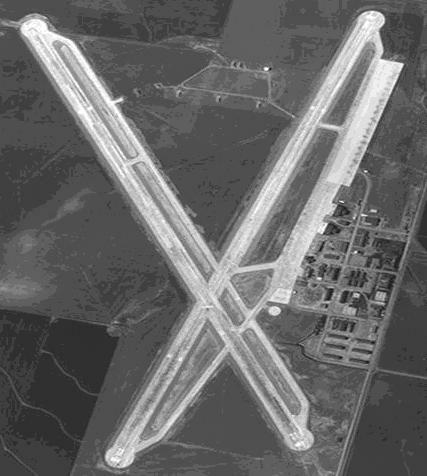 A circa 2011 aerial view looking west showed Patterson Airport remaining intact, and still marked with active runway markings. 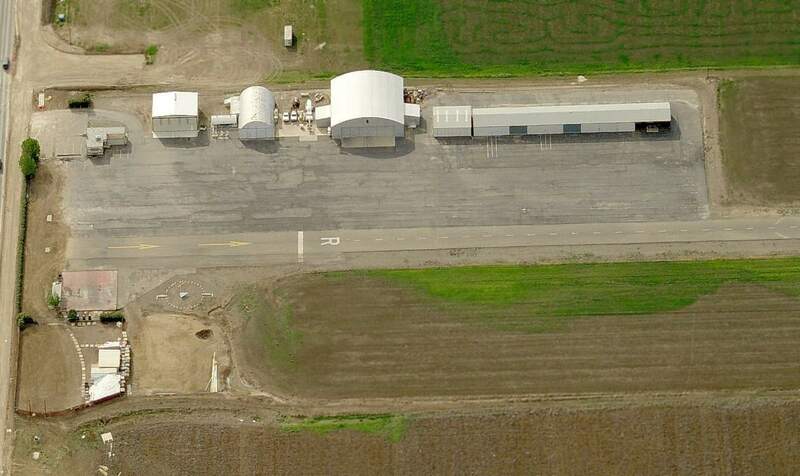 A 5/19/12 aerial photo still showed Patterson Airport's runway marked as an active runway. Patterson Airport was evidently closed within the next few months, as an 8/23/12 aerial photo showed the runway markings had been painted over. According to a 2013 city council report (courtesy of Jonathan Westerling), Patterson Airport was closed. A 2015 aerial view looking northwest showed Patterson Airport remaining intact though abandoned. What a shame to see such a nice little general aviation airport go completely unused for years. A 4/4/17 photo by Jonathan Westerling looking northwest at the hangars of Patterson Airport. Jonathan observed, “With all the houses & industry around, it doesn't seem to make sense that this little airport would close. with the huge CVS & Amazon fulfillment centers looming in the background. Patterson Airport is located northwest of the intersection of Sperry Avenue & Park Center Drive. 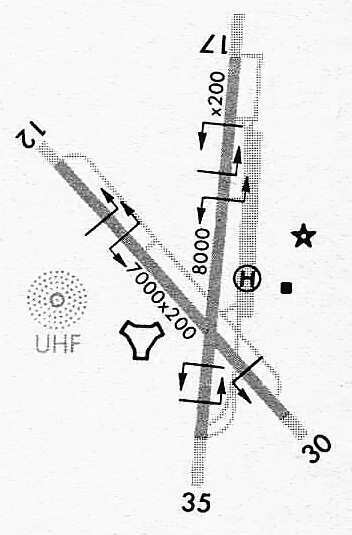 Santa Nella Airport, as depicted on the June 1963 San Francisco Sectional Chart (courtesy of Chris Kennedy). nor on the March 1956 San Francisco Sectional Chart (according to Chris Kennedy). The earliest depiction which has been located of Santa Nella Airport was on the June 1963 San Francisco Sectional Chart (courtesy of Chris Kennedy). It depicted Santa Nella as a public-use airport having a 3,800' unpaved runway. The Santa Nella Airport was located just south of a small subdivision called Santa Nella Village. which was finished in 1967 to capture mountain runoff to irrigate the crops of California’s prospering Central Valley. described Santa Nella as being a public airport with a single 4,000' oiled dirt Runway 7/25. The operator was listed as Gerald Hoyt. 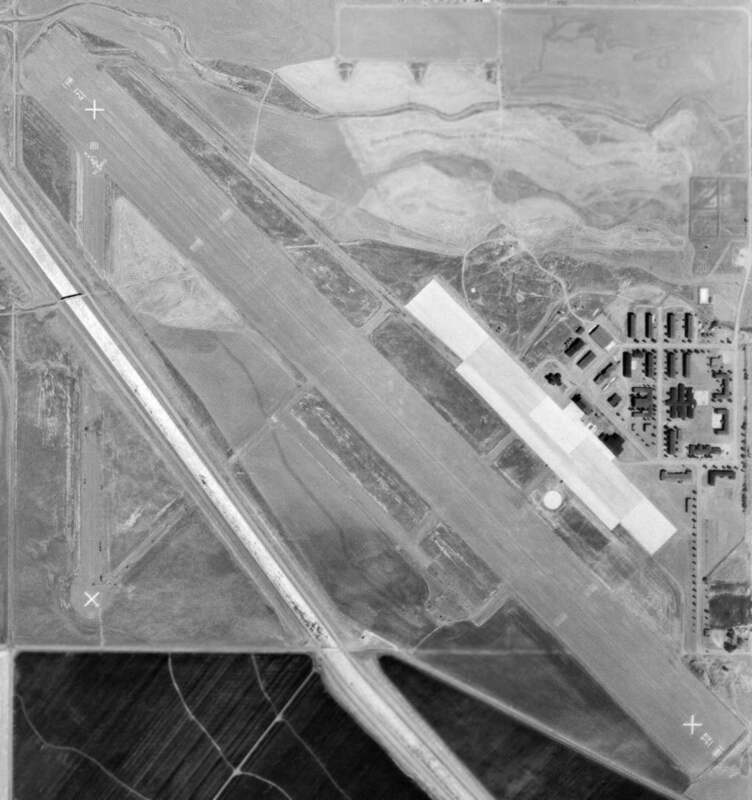 The only photo which has been located showing Santa Nella Airport during the period it was operational was a 8/31/67 USGS aerial view. It depicted a single east/west runway, but there were no aircraft, hangars, or other signs of recent aviation usage. 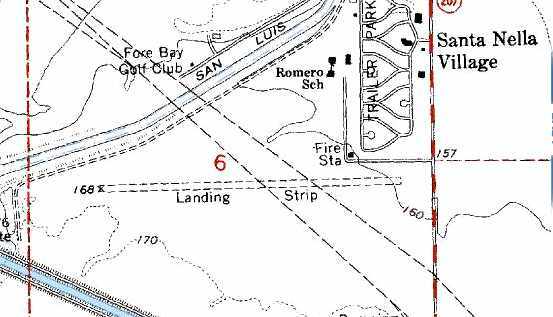 The 1969 USGS topo map depicted Santa Nella's single runway, but labeled simply as “Landing Strip”. depicted Santa Nella as a public-use airport, having a 4,000' unpaved runway. An interesting reference to the Santa Nella Airport can be found as part of a 1979 Lawsuit (courtesy of Jonathan Westerling). It said, “On 6/4/74, Edward Golde landed a small airplane at the Santa Nella Airport in Merced County. He had a certified private pilot's license. The plane contained 800 to 1,000 pounds of marijuana with an agreed street value of $256,000. He had obtained the marijuana in Mexico. NTSB records listed activities at Santa Nella Airport through 1977 (according to Jonathan Westerling). listed Santa Nella as a “private” airport, with parachuting operations on the weekends. depicted Santa Nella as a private field having a 4,000' unpaved runway. but without any sign of recent aviation use. 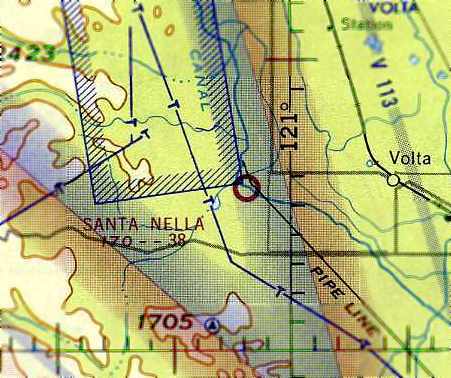 The 1991 USGS topo map depicted Santa Nella's single runway, but labeled simply as “Landing Strip”. as it was no longer depicted at all on the 1993 San Francisco Sectional Chart (according to Jonathan Westerling). covering the eastern end of the former runway. A 2005 aerial photo by Jonathan Westerling looking northeast at the site of the Santa Nella Airfield. The site of the Santa Nella Airport is located west of the intersection of Centinelia Drive & Santa Nella Road. A 1943 National Archives aerial view looking west at Crows Landing. Crows Landing was not yet depicted on the 1933 Aeronautical Chart (courtesy of Dallam Oliver-Lee). 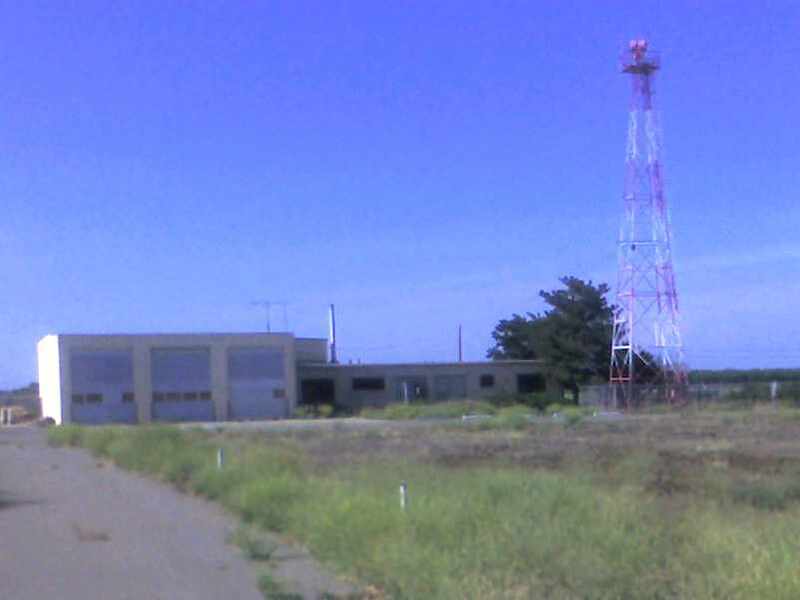 This airfield was built in 1942 as a satellite airfield for Alameda NAS. which depicted the field as having 2 paved runways, taxiways, ramps, and several buildings. The facilities at Crows Landing were complemented by nearby bombing & gunnery ranges. depicted the field in much the same manner as the 1943 photo. A 1944 photo by Wayne Hilton of a Beechcraft GB Traveller at Crows Landing. 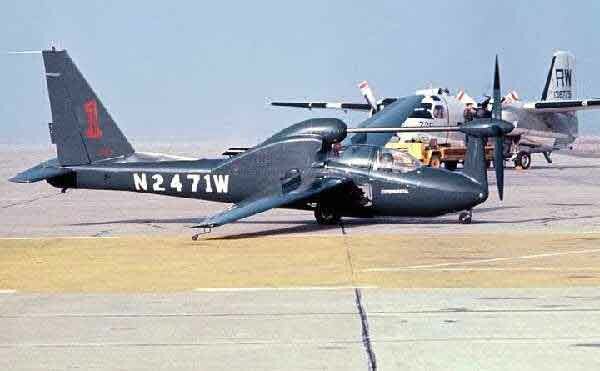 Wayne recalled, “This airplane belonged to the station - not a squadron. It was used for spotting good duck shooting locations mostly. “I was an Aviation Radio Technician 2nd class there at NAS Crows Landing. to take care of the airplane & tower radios there at Crows Landing. The job called for a chief radio tech but it was my fate to fill in. Much responsibility but I had been a radio amateur for long time so had no problems. Most aviation bases were pretty lax on formality so duty was OK. I got liberty on some weekends. Of course the nearest liberty town was Modesto - 20 miles distant. I fixed everyones' car radios etc so I was treated very well. I got extra food, etc. was on the August 1944 Regional Aeronautical Chart (courtesy of Jonathan Westerling). swerved off the Crows Landing runway during a crosswind landing & ended up in a ditch on April 1, 1945.
as a 680 acre cross-shaped property containing 2 concrete 7,000' runways, oriented north/south & northwest/southeast. The field was said to have a single 125' x 60' wood nose hangar, and 2 additional hangars under construction. 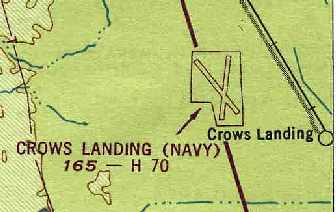 Crows Landing was described as being owned by the U.S. Government, and operated by the Navy. The Crows Landing airfield was reduced to caretaker status in 1946. A 1947 Navy aerial photo looking north at Crows Landing. as having 2 paved runways, with the longest being 7,000'. 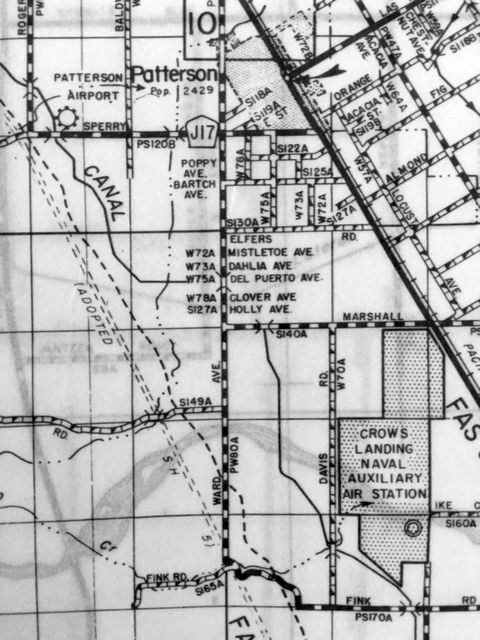 “Crows Landing Naval Auxiliary Air Station”, as depicted on a 1952 CA Highways map (courtesy of Kevin Walsh). as having 2 paved runways, taxiways, ramps, streets, and several buildings. on the 1955 & 1956 San Francisco Sectional Charts (according to Chris Kennedy). with the longest being a 7,000' concrete strip. The remarks said, "Official business only, Unattended. ALF to NAS Moffett." 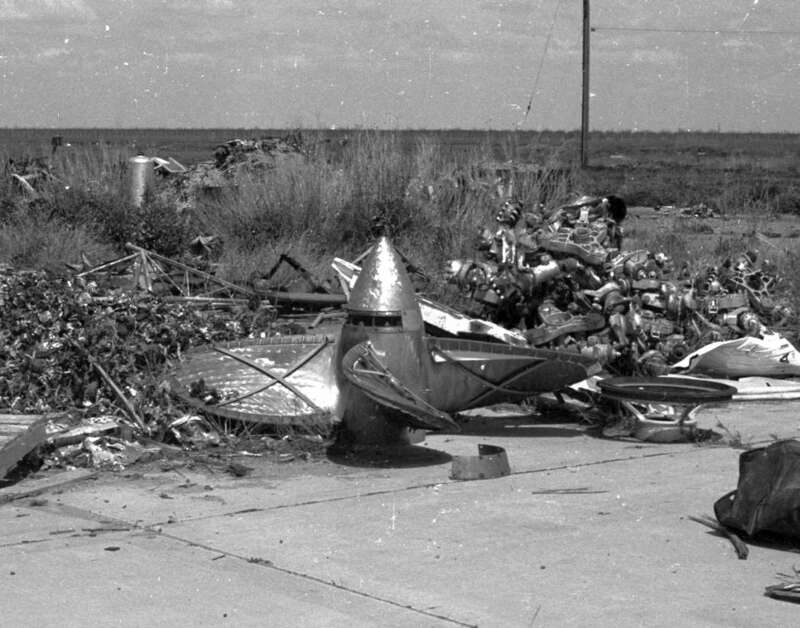 A circa 1950s photo (courtesy of Rex Ricks) showing a Navy F3H Demon landing next to a fresnel lens landing aid at Crows Landing. A 3/23/57 aerial view depicted Crows Landing Naval Auxiliary Landing Field as having 2 paved runways, taxiways, ramps, streets, and several buildings. and once the famed Blue Angels performed there. given the practice bombing range that existed for many years in the mountains just to the west of that base. would sneak onto the bombing range & would retrieve unexploded ordnance. He would dismantle them & sell the metal for scrap. One day he mishandled one of the bombs & that was the end of Mr. Boschi." 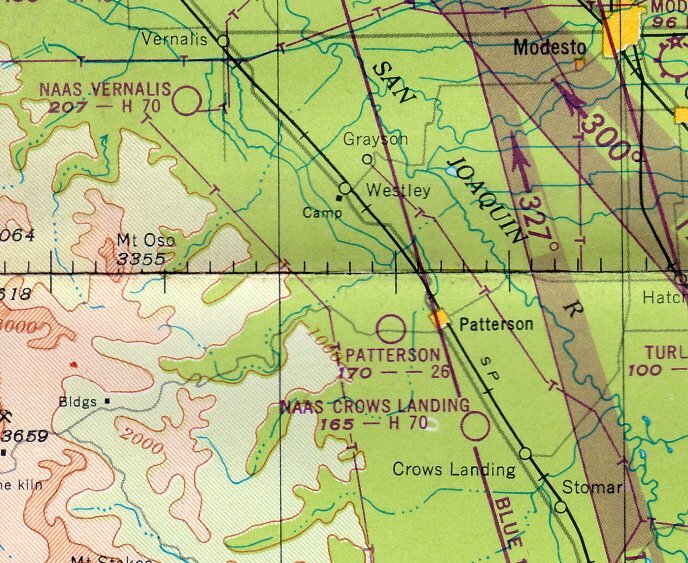 Crows Landing was still listed as an "ALF to NAS Moffett"
on the 1965 San Francisco Sectional Chart (courtesy of Chris Kennedy). Walter Ward recalled, “My father (Walter Francis Ward) was the Officer in Charge at Crow’s in the mid-1960s. I have many fond memories of Crow’s Landing (in particular the Crow’s Nest) the tower & fire station & the old administration buildings. A sailor taught me how to swim in the pool there. Many, many fond memories of exploring the place & discovering all sorts of interesting things. 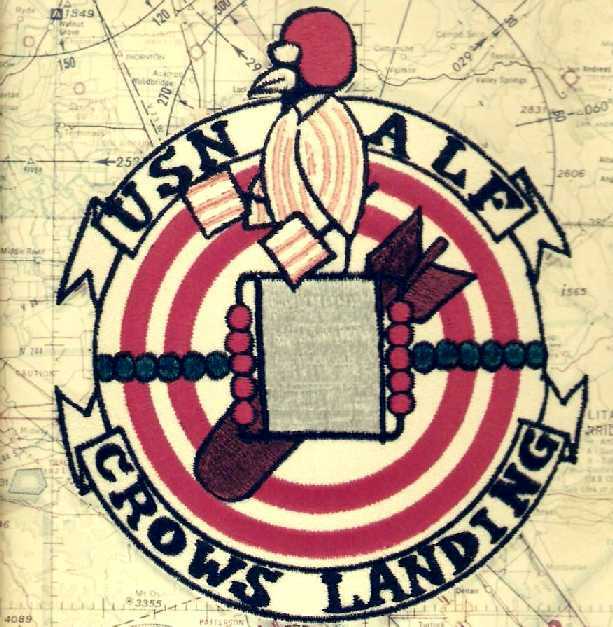 A Crows Landing patch (courtesy of Mike Roe, who was stationed there from 1967-68). 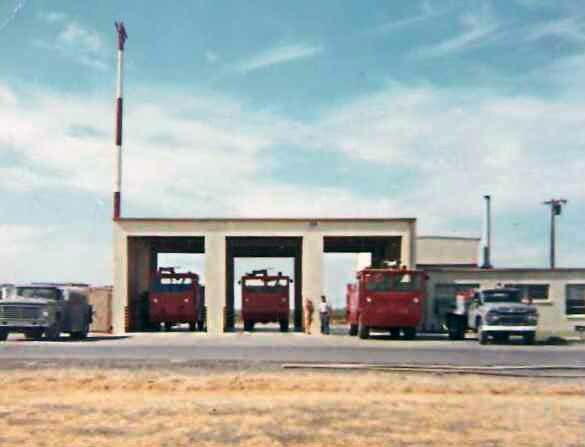 A 1967 photo by Mike Roe of the Crows Landing fire station. Mike recalled, “Crows Landing was my first duty station after boot camp. I got there in July of 1967 & was transferred to NAS Lemoore in April 1968. My first task was selling beer at the CanAm race we put on in 1967. I was still attached to 1st Lt Div at that time. Then I became a fire truck driver. The Navy Exchange was built by all hands with money earned by selling the beer at the race. The building itself was made of 2 ammunition bunkers, quonset hut types, attached at the top. with a Navy S-2F in the background. 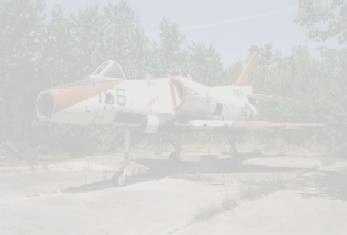 which had been created under Operation Prize Crew to develop a quiet reconnaissance aircraft. and shortly thereafter were transported to Viet Nam for operational use. Mike Roe recalled, “I was on the hardstand when that little experimental job [the QT-2PC] came out for testing. He left & said he would be back in an hour or so. Three hours later there was still no sign of him. Howard Gillins recalled, “I was at Crows Landing from 5/68 to 6/70. I was assigned to the Crash Fire Rescue Dept under civilian Fire Chief Walt Latham. We had 1 SAR helo assigned at Crows Landing: an H-34 & later an H-2. We had at that time 50 enlisted ( 5 CPO including LCPO) 1 OIC (Lcdr) & 5 civilians. We built & occupied the Club / Rec Center / Ship Store. We provided daytime touch & go practices for the military aircraft & at night carrier landing practices. We supported the LSO, hot refueling & minor maintenance & repairs. We mostly supported A-3, A-4, A-7, P-3 aircraft but were subject to any & all military aircraft. I lived in Patterson. All the military & civilians lived in the surrounding communities (Patterson, Crows Landing, Newman). We used the medical / dental & commissary services of Castle AFB. We received extra pay because housing & messing was not afforded at Crows Landing. We obtained odd jobs hired by local farmers to supplement our pay. It was a really nice place to work & live. We had numerous NAVAIR planes flying to us for ops because nobody complained. 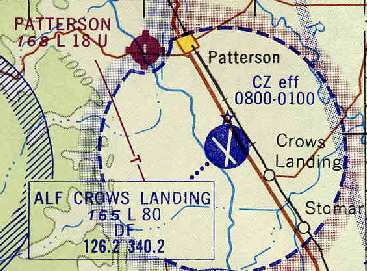 Crows Landing, as depicted on the 1971 DoD Instrument Approach Procedures (courtesy of Chris Kennedy). Bud Bondietti recalled, "I was stationed at NALF Crows Landing from 9/71-4/74. My rating was Aviation Ordnance & I was assigned to the line crew & back-up target range personnel." A 5/2/73 photo of the unusual NASA C-8A Buffalo (NASA-716) Augmentor Wing Jet STOL Research Aircraft taking off from Crows Landing. Crows Landing was the site of DC-6 flight tests from 11/9/76-12/9/76 (according to Bruce Grolmier). and Navy F-4 Phantom MLS flights from 11/17/77-12/14/77. 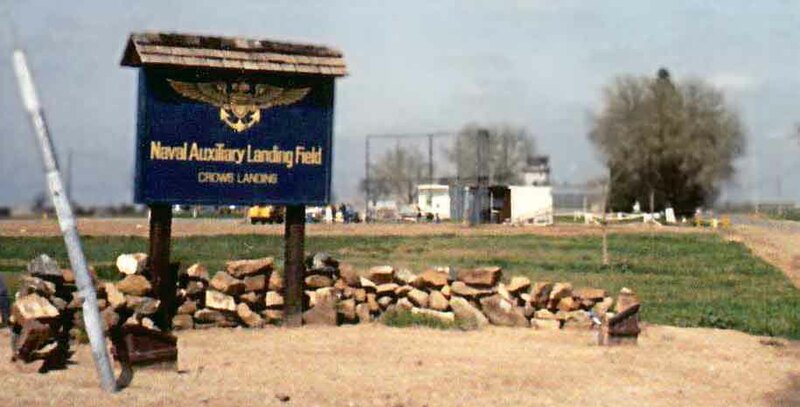 Crows Landing was the site of Army UH-1H & Lear Jet flight tests from 1/30/79-2/1-79 (according to Bruce Grolmier). and was the site of Hughes 500D COBRA testing in September 1980.
as well as YO-3A flight testing in 4/28/82. conducted flight test operations at Crows Landing. Moffett Field is located in the densely populated San Francisco Bay area which has a high level of commercial & general aviation traffic. it was located in an agricultural area with few population centers & there was minimal air traffic in the vicinity. and analog receivers & recording equipment, a radar tracker & a Laser tracker. Martin continued, “The site at Crows was suitable for flight test that had a higher than normal risk. using Crows Landing as a base & for data acquisition. A 1983 photo by George Jones of an F/A-18 Hornet from Lemoore NAS making a practice carrier approach at Crows Landing NALF. 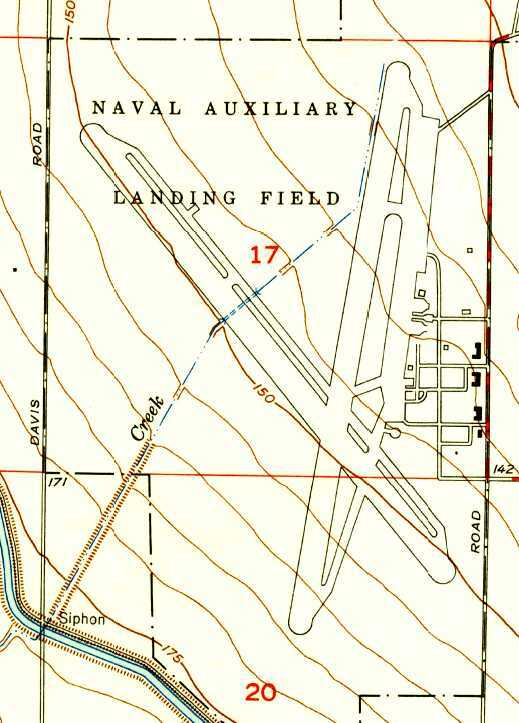 Crows Landing was also continued to be used by the Navy as an outlying training field. the field had a fair amount of Navy traffic, even though no Navy aircraft were stationed there. This consisted mostly of P-3s on training flights from NAS Moffett Field. would practice carrier approaches at Crows Landing prior to going through Carrier Qualifications. on either end of the main runway. 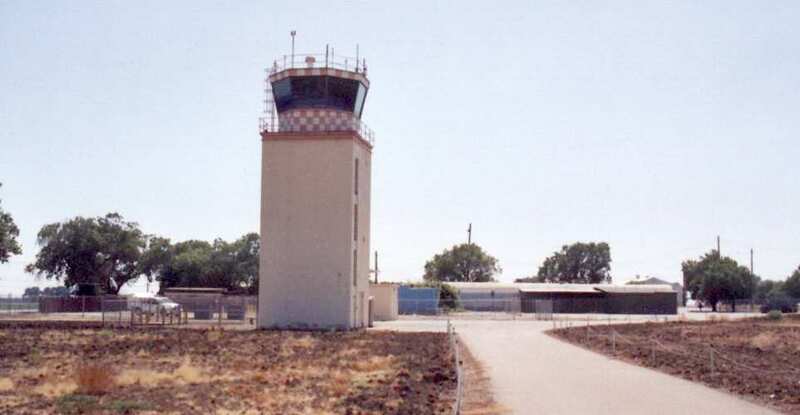 The Landing Signal Officers would fly up from Lemoore in an O-2. During that time, Navy personnel at the base consisted of 20-30 active duty sailors. Most were involved with maintaining the base & providing Crash & Rescue services. A 1985 photo by John Voss of the Navy entrance sign to Crows Landing. Eric Weber recalled, “From 1989-91 we would regularly use Naval Auxiliary Landing Field Crows Landing to shoot instrument approaches on local training flights. My Air Force squadron was the 1400th MAS McClellan AFB. We flew the C-21 which is a Lear 35 equivalent. 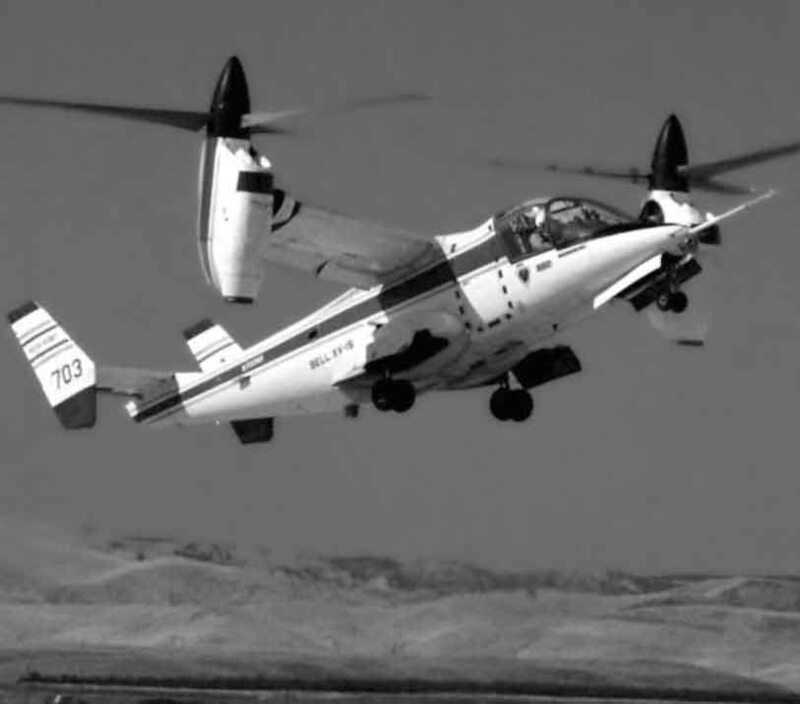 NASA intermittently used Crows Landing to support flight tests by aircraft based at Ames Research Center & other NASA facilities. According to John Crozier, “The Navy & NASA co-habited there for many years. The Navy closed down operation [at Crows Landing] in the early 1990s, as part of the NAS Moffett Field closure. NASA then became the operator of the field. 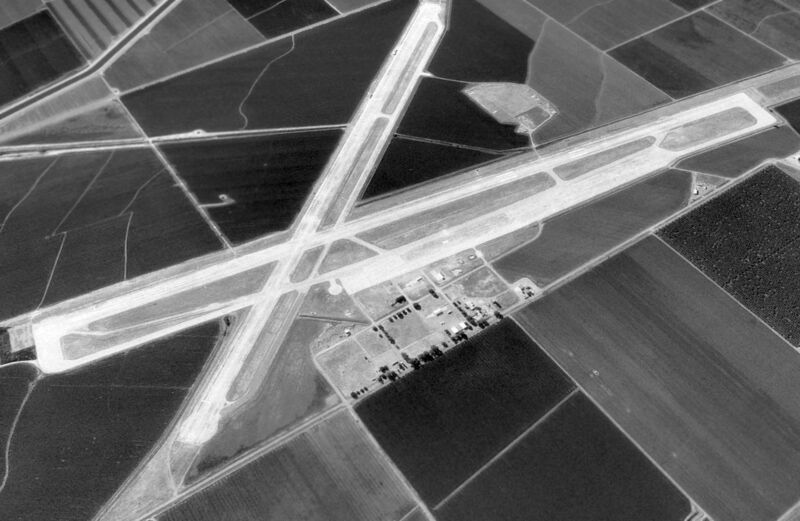 Raymond Meyer recalled, “NASA only had title to the airfield for a short period of time. Expenses became a burden on their budget. It was decided to turn the airfield into a 'Federal Airfield'. and it spread base expenses over a number of agencies. resulted in a successful emergency landing of the XV-15 at Crows Landing. 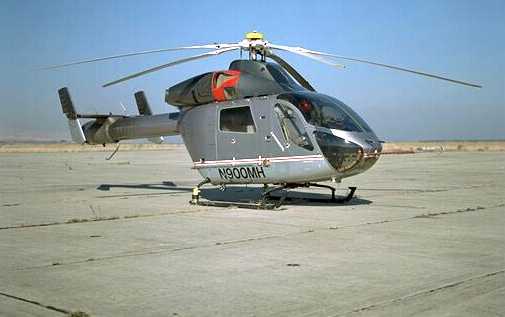 was an 11/1/96 photo of a MD-900 Explorer helicopter conducting a NASA Ames noise abatement study. 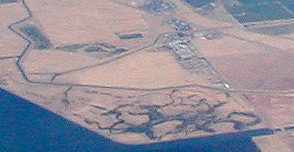 A 1998 USGS aerial view looking northwest at the Crows Landing Airfield. 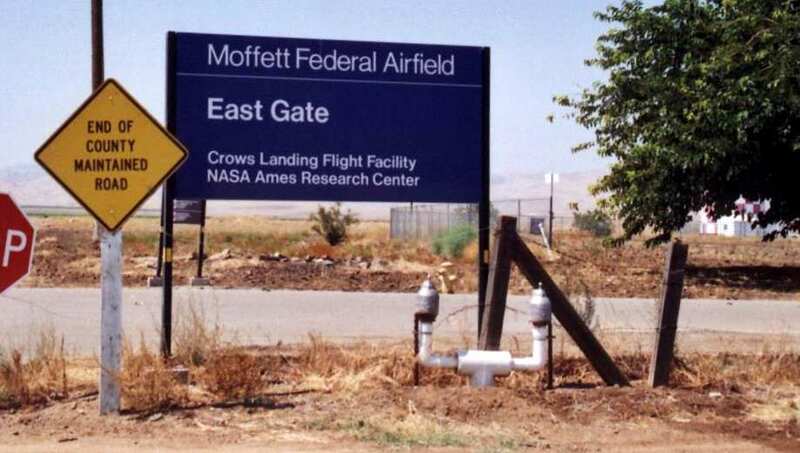 Crows Landing was closed in 1999 by NASA. 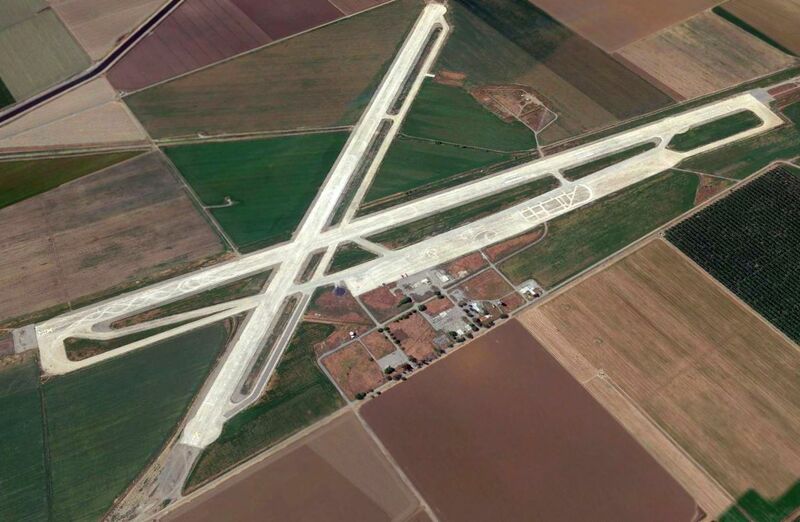 At the time of its closure, the airfield at Crows Landing consisted of 2 paved runways (the longest, 17/35, was 7,950'). Jack Daley reported in 2003 that Crows Landing is "Currently completing a massive EPA/Navy cleanup. It is mostly now owned by the County Of Stanislaus. under the auspices of (now former) Congressman Gary Condit (of the recent missing DC intern fame)." Jack continued, "The field is currently wide open with the nearby Sheriff Office substation conducting occasional patrols. The tower & crash building still stand, as do the field Recreation Building & pool area. 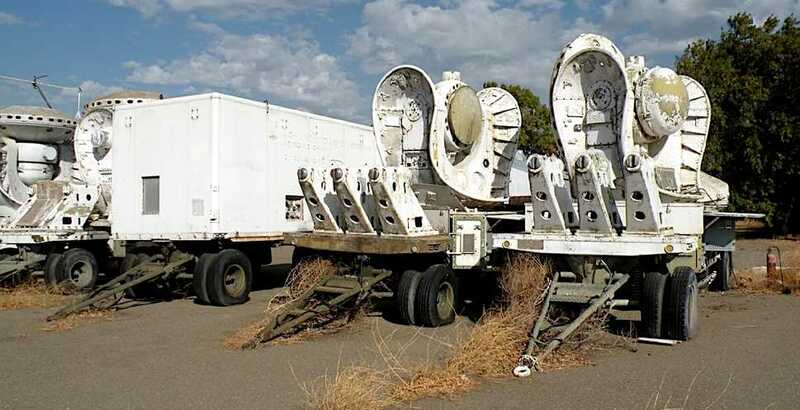 NASA has some trailers with satellite antennae in occasional use on the NE side of the field. No one is ever seen there from their offices at Ames. 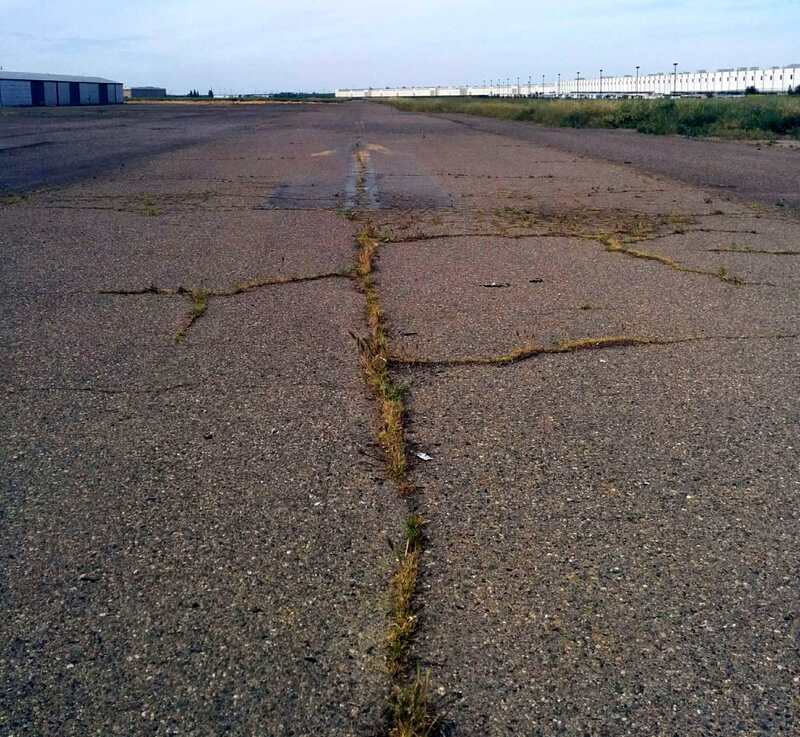 The 2 concrete runways are deteriorating fast. Ground water clean-up is continuing. The airfield is X'd off, but local trainers still shoot occasional touch & go's." Jack continued, "A year ago an SFPD chopper crashed nearby in the low lying valley fog trying to make the field. They had some sort of a maintenance problem while enroute from Visalia (where the aircraft was in for an annual!) back to SF. and possibly attract some aviation-oriented businesses. Talk of a park of some sort is just that - talk. FBOs are not interested due to this economy, and it's remote agricultural location. Not even dusters. The former Castle AFB in Atwater/Merced a few miles away is in a much more attractive urban setting." 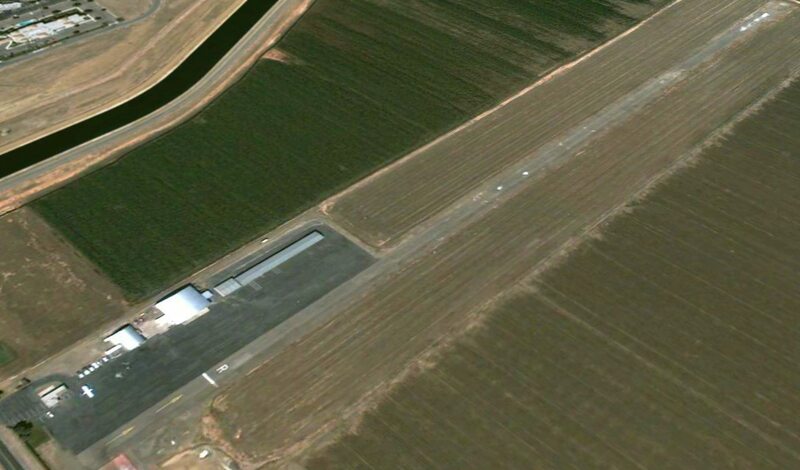 which (confusingly) labeled it as "Moffett Federal Airfield, Crows Landing Flight Facility". 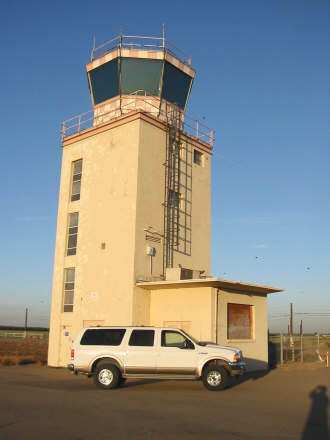 A 2003 photo by John Voss of the control tower at Crows Landing. 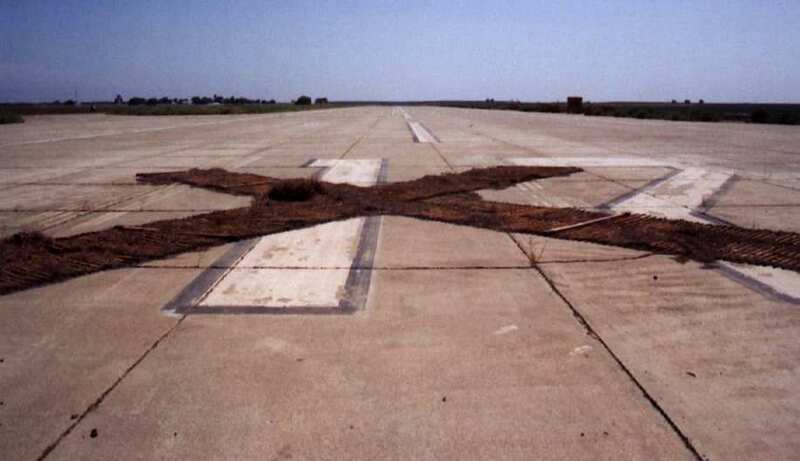 with the numbers covered by a wooden closed-runway "X" marker. A February 2005 aerial photo by Jonathan Westerling looking west at Crows Landing. Jonathan observed, “Crows Landing looks to be in good condition. 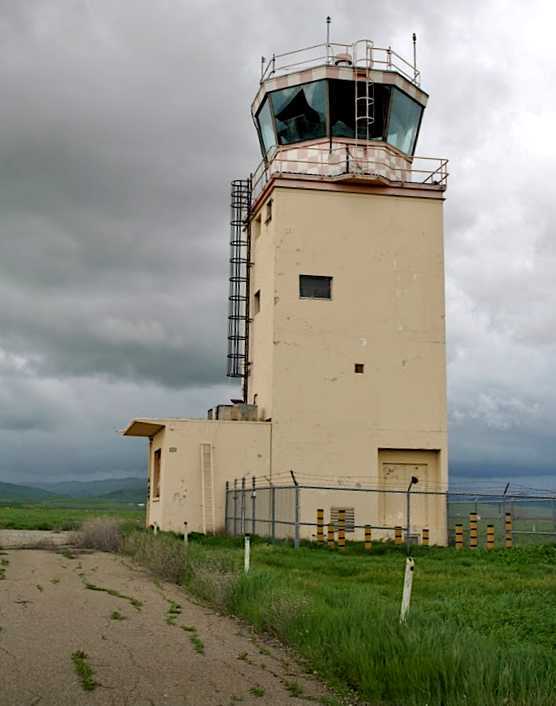 An October 2005 photo by Pen Parks of the abandoned Crows Landing control tower. A December 2006 aerial view by Ian Carisi looking southeast at Crows Landing. as the Crows Landing Business Air Park. and see what things were like out there after all these years of neglect. into a business airpark supporting business & general aviation. involved in the development project of this facility. I actually took the time to drive the runways & come to some sort of determination as to the shape of the runways. In my opinion, they're still in remarkably good shape. Chris continued, “Here is what I found: Runway 30 is no longer X'd off. It is certainly still in a usable condition short of some loose gravel at the threshold end of both ends of the runway. but little of it remains as the lumber was burned & all of it piled up directly in the middle of the numbers. Runway 17 no longer appears to be X'd off. there is some loose gravel strewn about this end of Runway 17. There is also some agriculture related materials just off numbers end of Runway 17. There is a lot of agriculture operations taking place on the grounds of the former NALF. 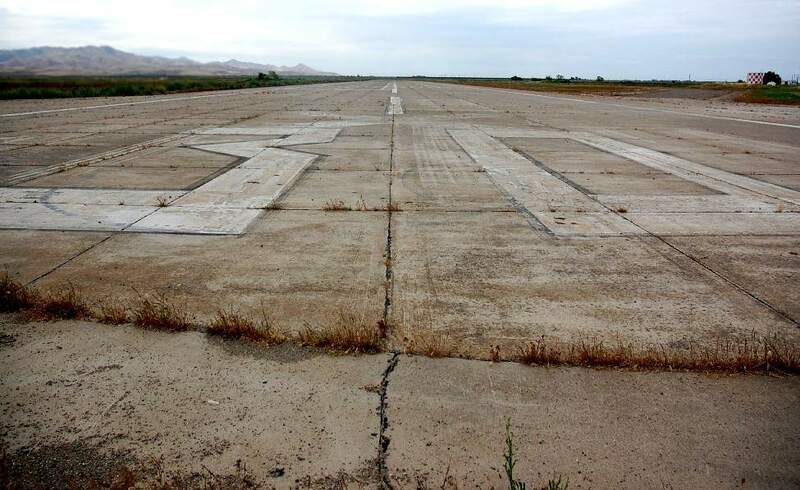 Runway 35 has a partial X (single line) atop the numbers. other than the indication of the field being closed on the San Francisco sectional. In my opinion, the runways at 7,000+ feet each, are still in good enough shape for use by the occasional training flight. for driving training occasionally during the work week. I'm not sure how'd they take to a landing aircraft during these operations. Chris continued, “I also walked around some of the facilities. The former Navy Exchange building is definitely in serious decay. A 2007 photo by Chris Thompson of the former base fire station & beacon light tower. Chris continued, “I expect the county will only restore the tower & the fire station. I decided to take a little risk & enter the tower building. The door has since been pried open & all that holds it shut is a trash can. There are postings on virtually all the buildings regarding asbestos. Certainly, I was careful not to disturb any materials that might kick up dust containing asbestos. I climbed the cement stairwell in the tower up 3 floors. where equipment once was installed & since removed. All that remained was the racks & cable harnesses. as the mounting hardware securing the ladder did not appear secure enough to hold my weight. This was disappointing as I was curious as to the condition of the operations area of the tower. 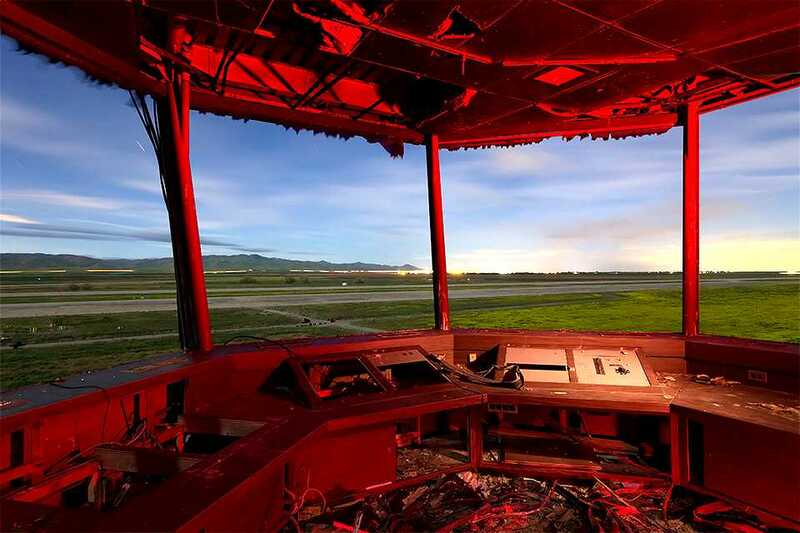 A 2007 photo by Chris Thompson of the abandoned Crows Landing control tower. Mike Roe reported, “In 2007 I drove out to Crows for a look-see. Very spooky... and disappointing to see the old place in such disrepair. I was nervous about being there as there were Keep Out signs all around. 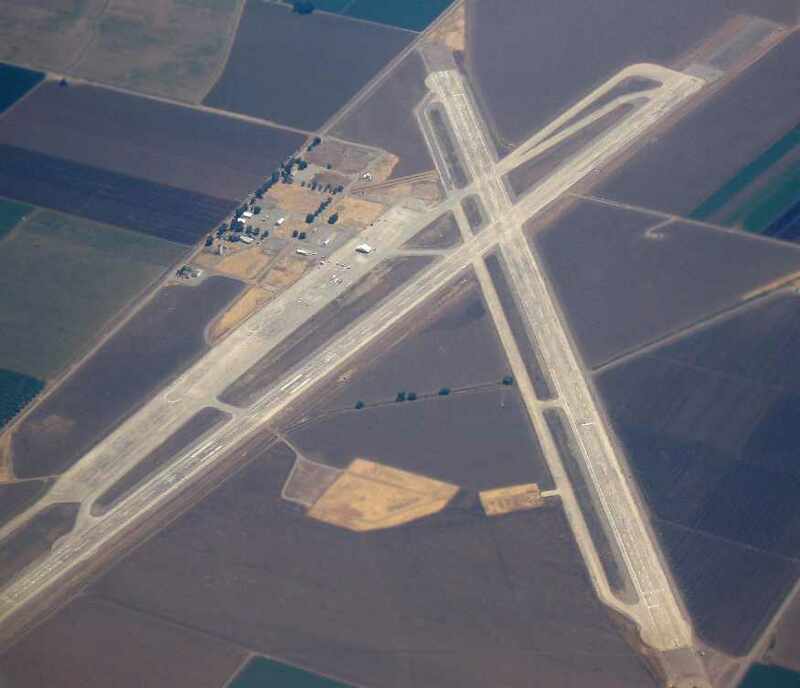 John Crozier reported in 2008, “Although not marked with X's, I do not believe the runways are yet certified for public use. A 10/18/08 photo by Andria Corosati of tracking radars from a Nike Hercules missile system at Crows Landing. What was their purpose at Crows Landing? 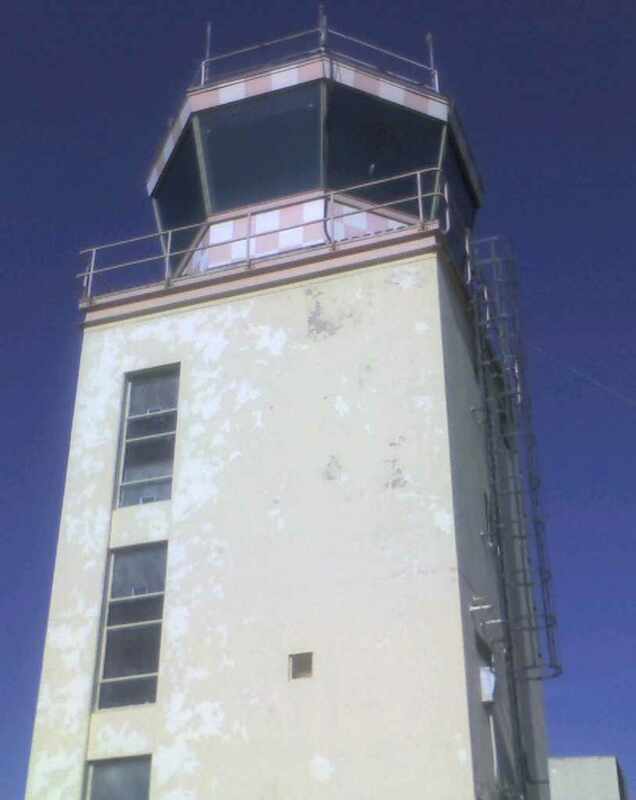 however, its very clear that there has been a lot of vandalism, especially with the control tower. The most  photo of the control tower shows the windows still intact. Since then, it looks like a number of the windows were kicked out, and there is a fire extinguisher hanging out of one of them. that look like they've been there for a while. I was leery of getting too close, as it seems they have become home to a swarm of bees. The Stanislaus County Sheriff uses the site. A 2/26/10 photo by Andria Corosati of the Crows Landing tower, showing the broken windows. Andria reported, “The vandalism has gotten worse - the windows in the control tower have now been broken out from the inside. I did not stay long this time to better inspect the facility as there were some rather sketchy people hanging around & I felt rather unwanted. A May 2010 photo by Mike Molsbergen looking northwest along Crows Landing's Runway 30. Mike reported, “My wife & I made a drive by Crow's Landing yesterday. It's a sad sight. The buildings are in bad shape & many are overgrown. The tower is a mess with many broken windows. Some of the roads are barricaded with Stanislaus County signs. There was some kind of training going on with EMS vehicles at the site. Runway 30 can be accessed from the East boundary road. The old '30' is more visible than the 'X'. An amazing March 2013 photo by Troy Paiva of the interior of Crows Landing's control tower. 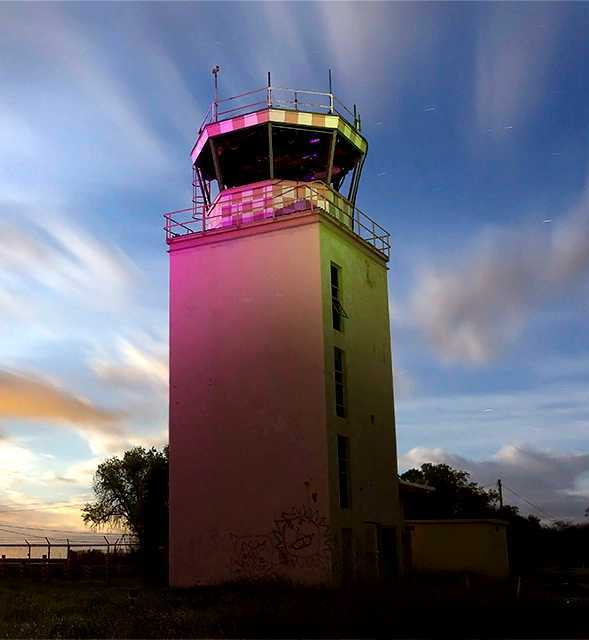 A March 2013 photo by Troy Paiva of Crows Landing's control tower. Troy reported, “The local Sherriffs still use the taxi/runways for tactical driving practice. 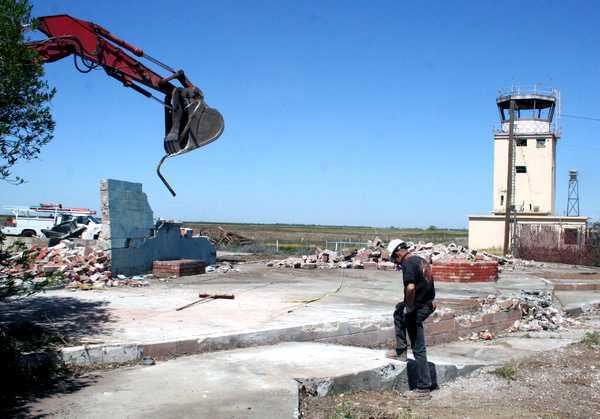 An April 2013 photo by Jonathan Partridge of the demolition of the Crows Landing Recreation building, with the Navy control tower in the background. described how NASA has been forced to demolish most of the buildings at Crows Landing due to frequent vandalism. Luckily the control tower will be left standing, at least for the time being, due to their historic value. A 2015 aerial view looking northwest at Crows Landing showing the extensive aviation infrastructure which remains. yet it was not listed at all in FAA Airport/Facility Directory data. Walter Ward reported in 2017, “To see the place now is very sad & deeply nostalgic. A circa 1942-43 aerial view looking north showing NAAF Vernalis under construction (courtesy of John Voss). 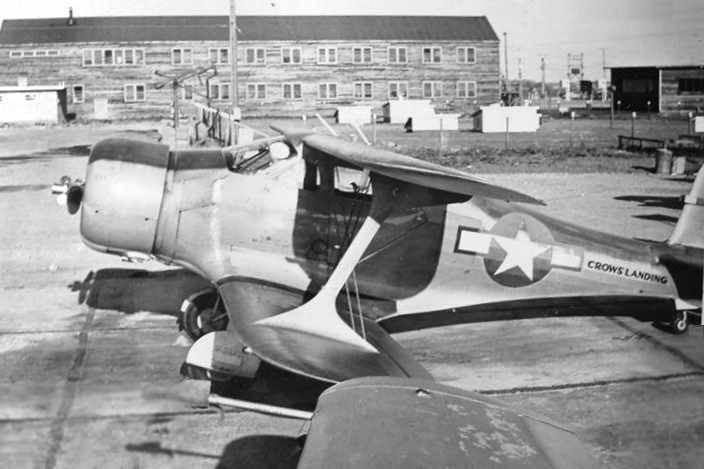 The Navy purchased 700 acres in 1942 to build a base to support 2 multi-engine patrol squadrons. The earliest depiction which has been located of Naval Auxiliary Air Field Vernalis was a circa 1942-43 aerial view showing it under construction (courtesy of John Voss). 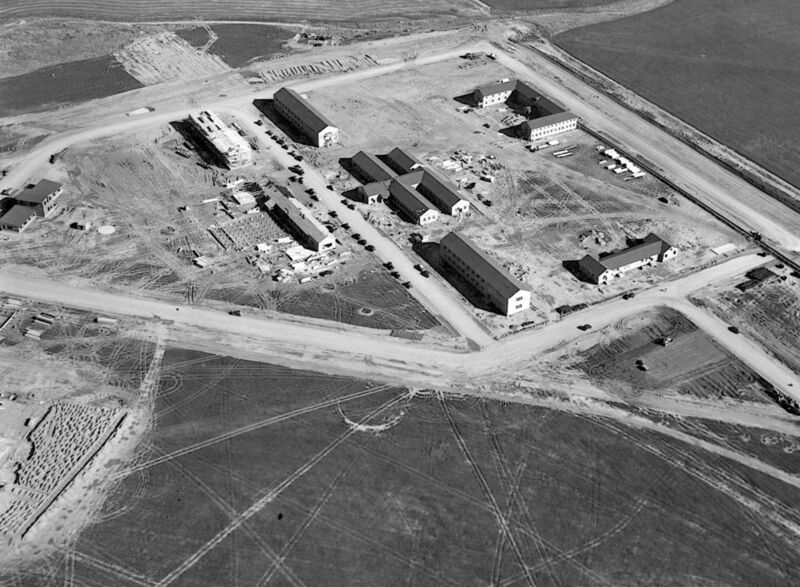 Barracks & administration buildings were being constructed, but the ramps & hangars had not yet been built. Naval Auxiliary Air Field Vernalis was commissioned in 1943. 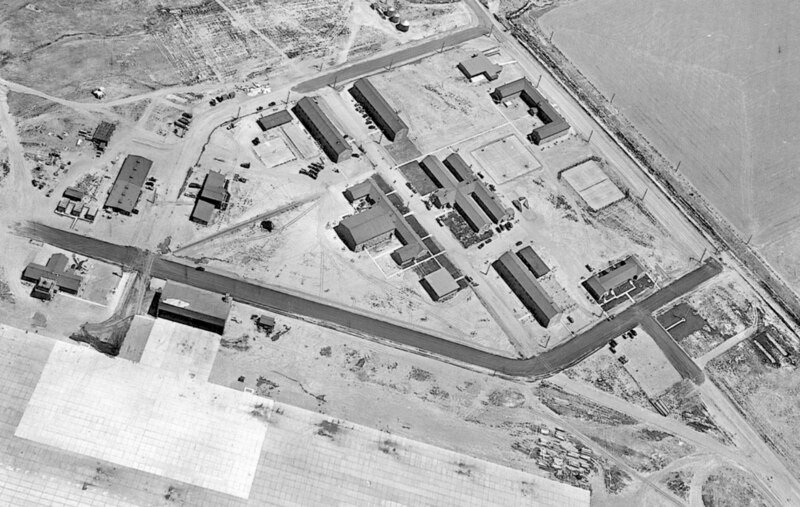 It would serve as an auxiliary of Alameda NAS, and initially had a single 4,000' x 500' tarmac runway. Gordon Bastien recalled, “Vernalis Auxiliary Naval Air Station...I was stationed there in 1943 for several months before shipping out to the Pacific. and trained the bomber crews in low-altitude bombing & aerial gunnery during the time I was there. I made my first rate at that base... Aviation Ordnanceman 3rd class. I also met my 'to be' wife in Modesto as that was our liberty town & we traveled in 'Cattle Cars' to get to town. That was a big trailer with bench seats & window cut outs being pulled by a truck tractor. It was always windy & cold and noisy riding in that damn thing. Later in 1943 Vernalis' runway was extended to 7,000', and the field was redesignated as a Naval Auxiliary Air Station. 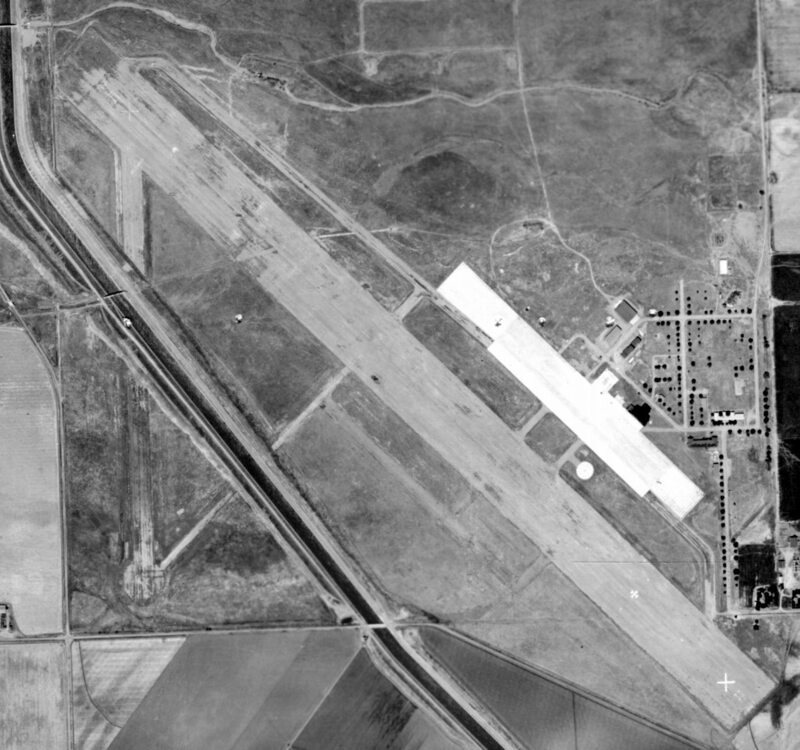 A circa 1943-44 aerial view looking north at the ramp, hangar, and other buildings at Vernalis (courtesy of John Voss). 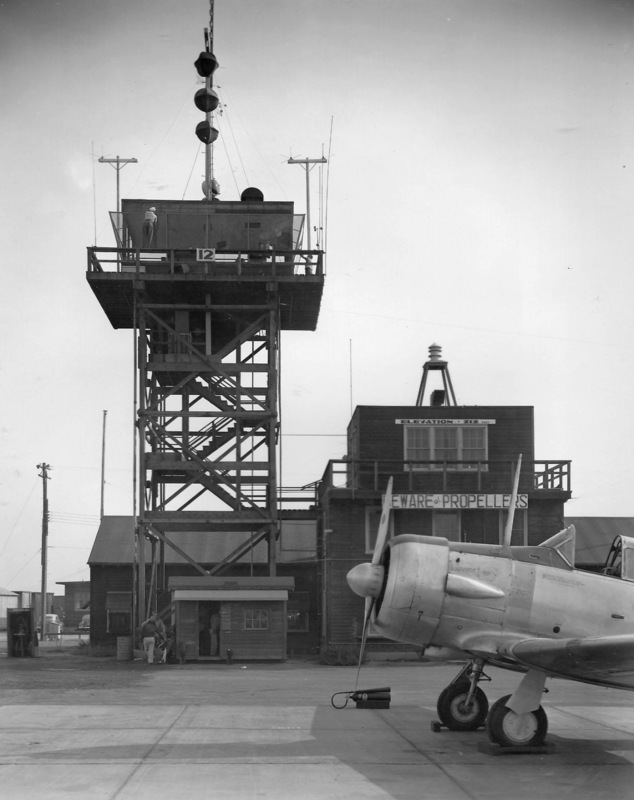 A circa 1943-45 photo of a North American SNJ Texan in front of the Vernalis NAAS control tower (courtesy of John Voss). In 1944, Vernalis' patrol aircraft were shifted to Crows Landing, and Vernalis became host to carrier squadrons. A 160 acre dive bombing range was added to support the carrier squadrons. Due to the limited crosswind capability of the smaller carrier aircraft, a 4,000' crosswind runway was added. Runway lighting was installed, as well as carrier catapult & arresting gear. with the flightline, hangars, and aircraft in the background. A circa 1943-45 aerial view looking east at a crowded NAAS Vernalis ramp, showing dozens of Navy aircraft, the control tower, hangars, and other buildings (courtesy of John Voss). and there were some bad accidents/explosions, in which there were injuries & deaths. At a strafing range on the Diablo Mountains to the west, a silhouette of a submarine was painted on the rocks to be used as a target. German POWs were housed at Vernalis late in the war, and assisted in construction projects. 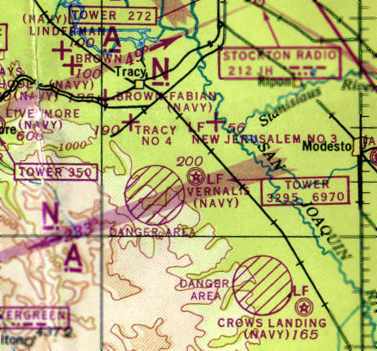 "Vernalis (Navy)" was still depicted as an active military airfield on the March 1945 San Francisco Sectional Chart (courtesy of Chris Kennedy). 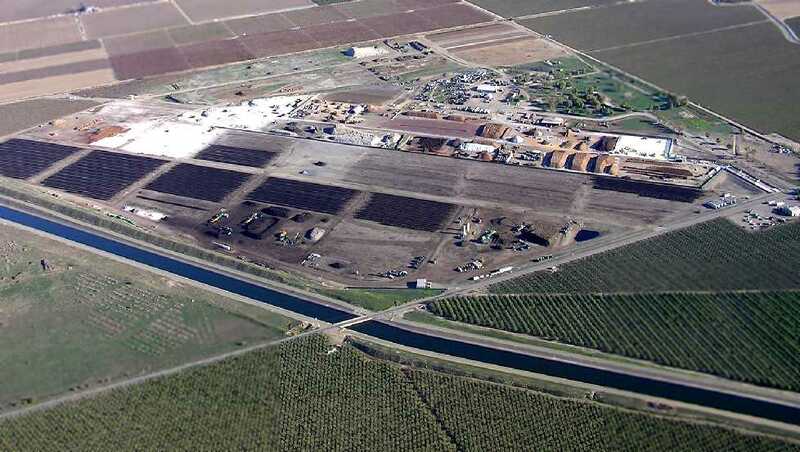 as a 710 acre square-shaped property containing 2 asphalt runways: 7,000' northwest/southeast & 4,000' north/south. The field was said to have a single 125' x 60' wood hangar. Vernalis was described as being owned by the U.S. Government, and operated by the Navy. 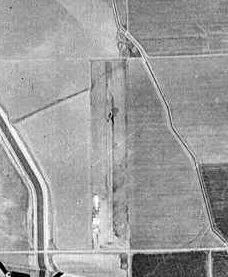 A circa 1940s aerial view looking south at Vernalis NAAS (courtesy of John Voss), showing the 2nd runway which had been added. This photo possibly was taken after the end of WW2, as the airfield was devoid of aircraft. After WW2, Vernalis initially was chosen to remain open; however, Crows Landing received the nod due to its concrete runways. On 10/15/45, Vernalis was placed on caretaker status & finally abandoned 3 months later. 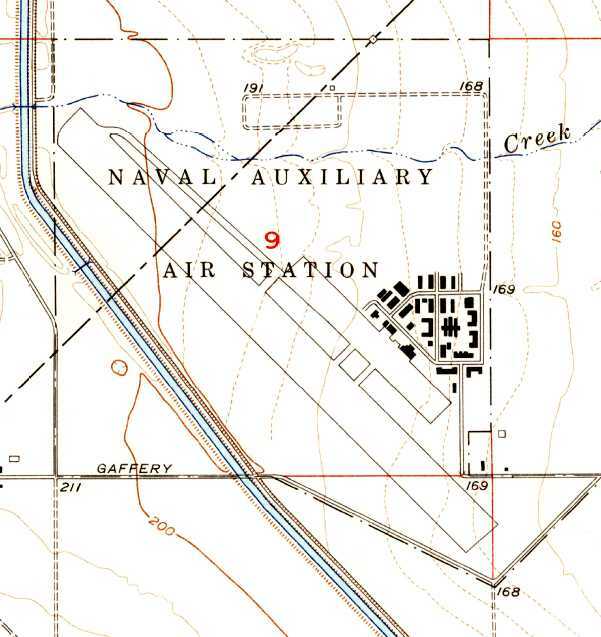 The 1952 USGS topo map depicted the Vernalis “Naval Auxiliary Air Station” as having a paved runway, parallel taxiway, ramp, and a large number of buildings. running through the middle of the crosswind runway. 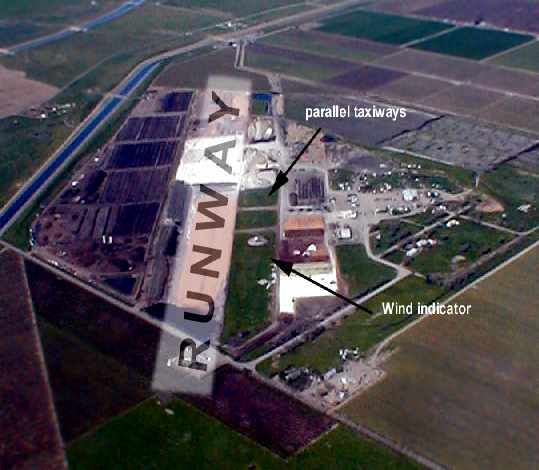 but the crosswind runway & its connecting taxiway had been bisected by the Delta Mendora Canal. The street grid, some buildings, the ramp area & portions of taxiways still existed. but the Aerodromes table on the chart included the remarks, "Closed. Emergency only." that performed "experiments" in the stratosphere. 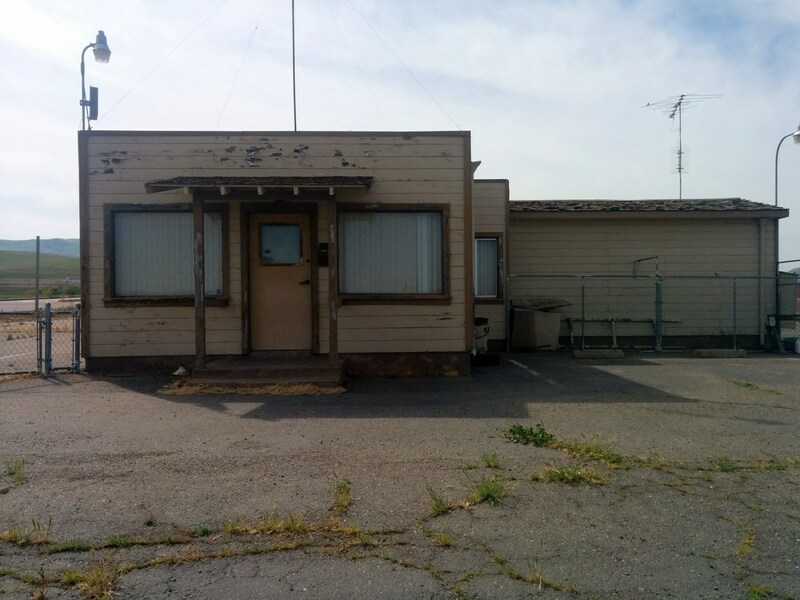 According to Scott Murdock, it was listed as the "Vernalis Geophysics Annex". The balloon launches Vernalis were operated by the Air Force Cambridge Research Laboratory. with the first balloon launched from Vernalis on 1/8/53. For this project, Vernalis (among other bases) was chosen to launch stratospheric balloons which traveled throughout the U.S. & landed in sites as far as Mexico, Canada, and Europe. (which eventually took place at the Eniwetok Proving Grounds in 1958). Richard Hector recalled, "I grew up on Gaffery Road in Vernalis; the road that led to the base. We moved to the area in 1960; my father was a farmer. The Vernalis base launched balloons… I think that this activity went into the 1960s. The last balloon launched from Vernalis was in 6/2/61, landing eventually in the Alaskan Aleutian Islands. 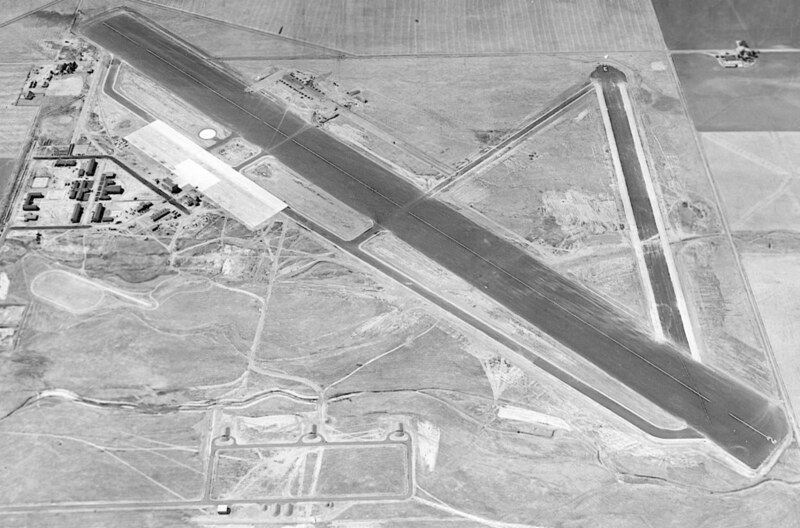 The street grid, some buildings, the ramp, a hangar, and portions of taxiways still existed. but that didn't last too long." 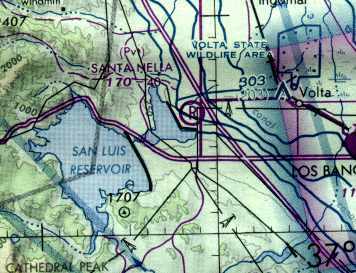 The Vernalis airfield was no longer depicted at all on the 1965 San Francisco Sectional Chart (courtesy of Chris Kennedy). However, it was still depicted as "Auxiliary #2" on the 1969 USGS topo map. 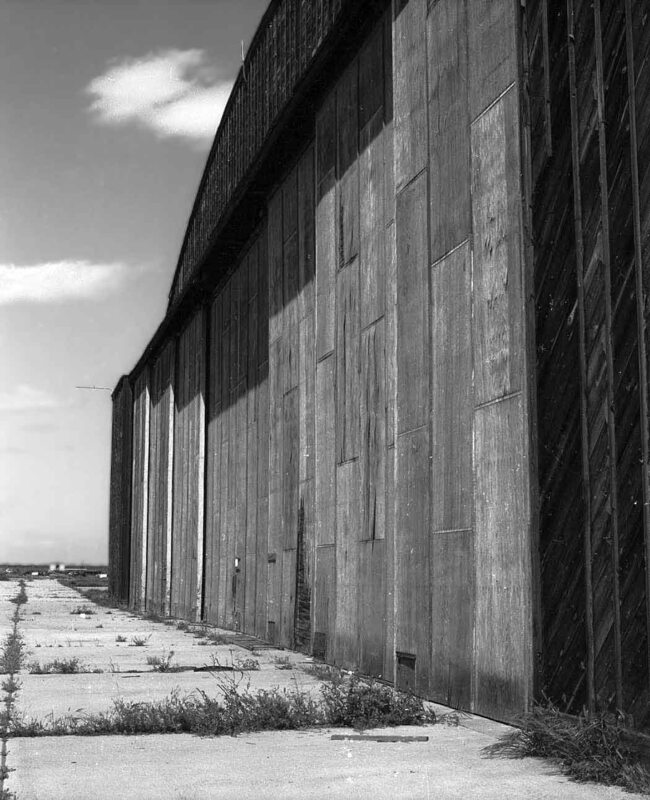 The last photo which has been located of the Vernalis hangar was a 1969 photo by Michael Guerin. A 1969 close-up by Michael Guerin of the Vernalis hangar. A 1969 photo by Michael Guerin of an unknown pole structure adjacent to the Vernalis hangar. A 1969 photo by Michael Guerin of what appears to be inexplicably a ship screw in a junkpile on the abandoned Vernalis ramp. 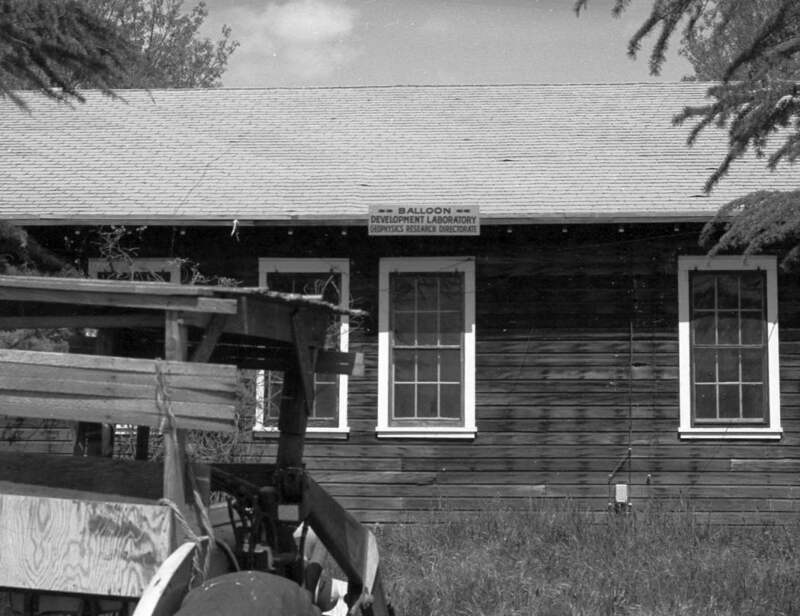 A 1969 photo of a building at Vernalis marked “Balloon Development Laboratory Geophysics Research Directorate”. Richard Hector recalled, "In the early 1970's the runway became the site of a drag strip & some real excitement. that, while never attracting the big NHRA type dragsters, was nevertheless quite a draw in the valley. Every Sunday, Gaffery Road saw hundreds of hot rods & trucks towing dragsters towards the air base. But by 1980 even this shut down & the agriculture-based businesses took over. the smell & the flies were unbearable if you were within a couple of miles of the place." A 1985 photo by John Voss of WW2-era buildings which still remained standing (until they were later torn down) at Vernalis. 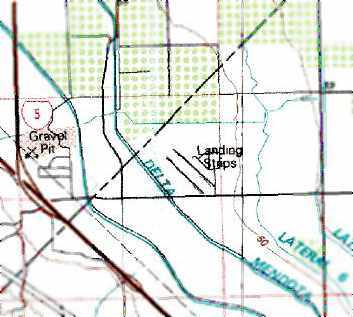 The Vernalis airfield was simply labeled "Landing Strips" on the 1989 USGS topo map. 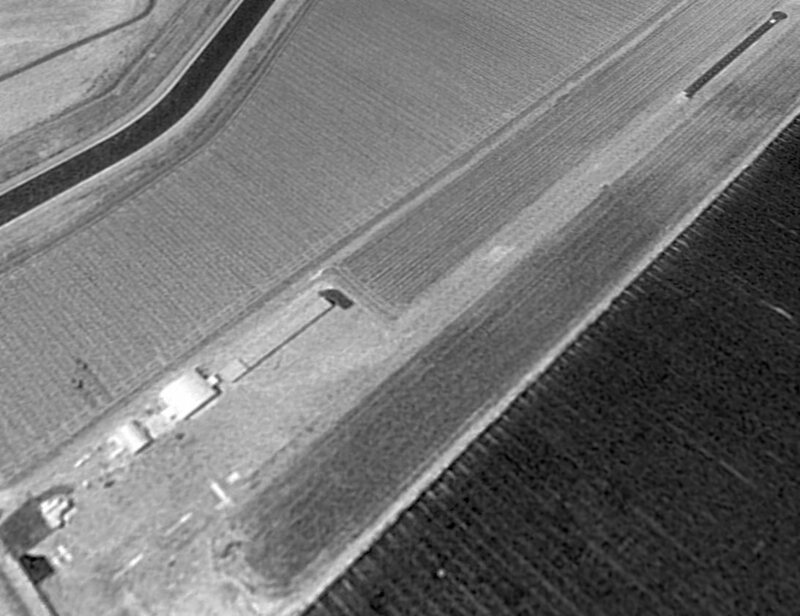 As seen in the 1993 USGS aerial photo, the property has been used for various agricultural purposes. as well as the outline of the crosswind runway, extending south from the canal. 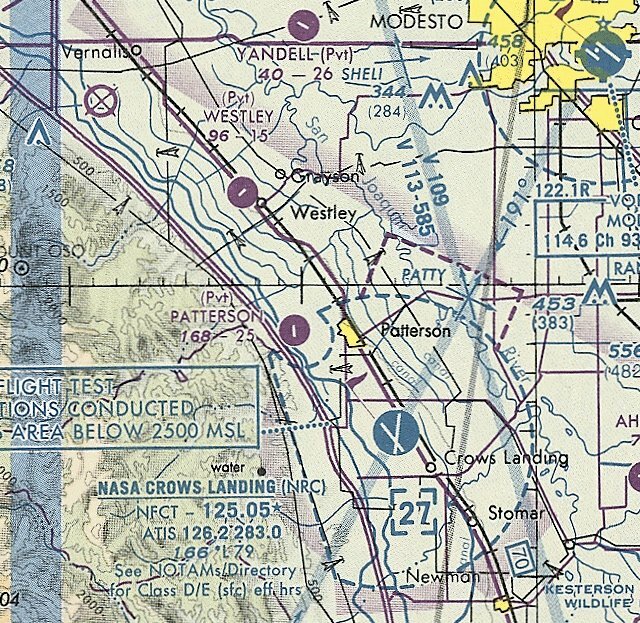 Vernalis was still depicted as an abandoned airfield on 2002 aeronautical charts. and a wood recycling operation located on the former ramp area. has finally had the last of it's guard towers torn down. 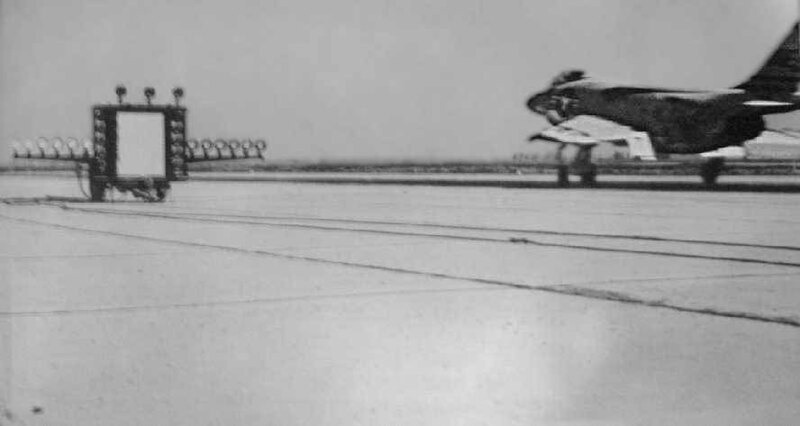 The asphalt runways - what's left of them - occasionally have a trainer shoot touch & go's. But since NASA closed nearby Crows Landing those concrete runways are more attractive. Such as they are." 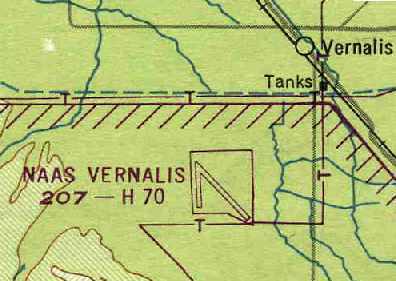 from the WW2-era Navy usage of the Vernalis airfield. 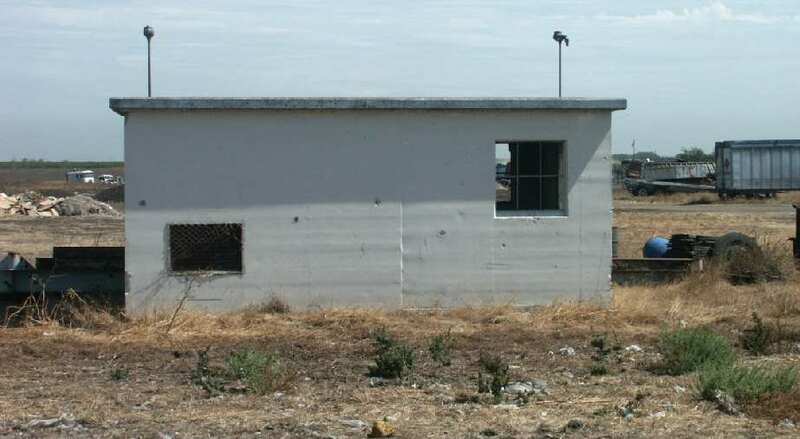 A 2003 photo by Tim Tyler of a small concrete building, which may date from the 1950s USAF usage of Vernalis. A 2003 photo by Tim Tyler of the runways of the former NAAS Vernalis, now used to store piles of dirt. A 2003 photo by Tim Tyler of the sign at the intersection of West Gaffery Road & the former main road to the base. The Vernalis site was also visited by Tim Tyler & John 'Boss' Voss in 2003.
all with large piles of their material along the old runway & ramp areas. and there were numerous 18-wheelers driving all over the place, loading & unloading material. but none of the old barracks, admin buildings, etc. There are numerous newer (but still old) buildings on site. 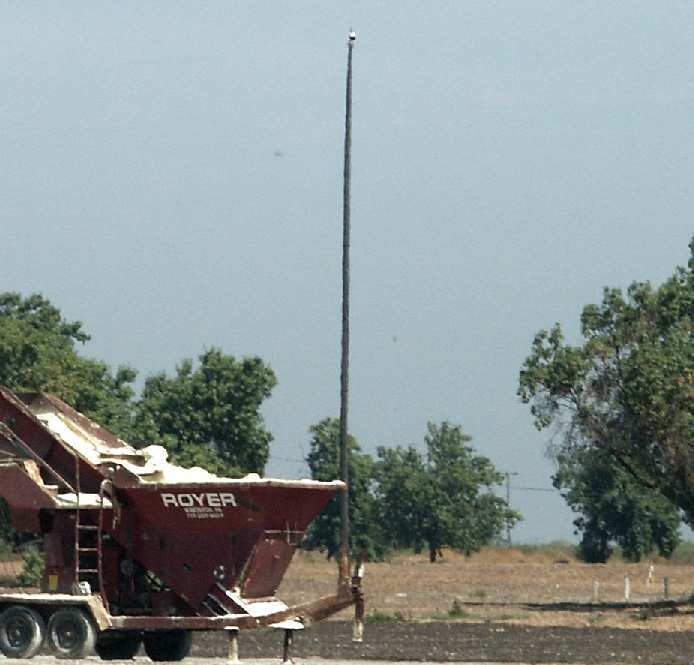 The flagpole is intact along the access road, with nothing else around it. however there were 2 concrete buildings. 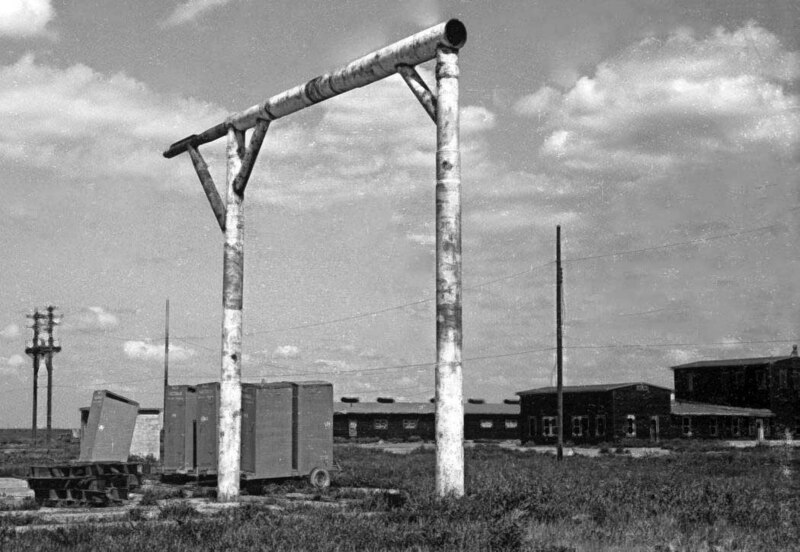 was the wooden flag pole along the entrance road to the site. There was nothing around it, nor was a flag flying." and his understanding was that the businesses had been located on the site for approximately 10 years. but wasn't aware at all of the history. He'd never observed any special remains or other items of historical significance in the couple of years he'd worked there. We asked him where the office was, so we could explain ourselves & formally ask for permission to explore the grounds. near some other old (but not military related) buildings, and John & I did plan on stopping there. collided with one of the numerous 18-wheeler trucks, and then the vehicle's occupants sued!" purported that small planes still occasionally shoot touch & goes there. "Based on what I saw on Wednesday, there's no way any non-suicidal pilots would do that." and then we went into business for ourselves in which we still operate out of the old base. but now he's downsized & mostly leases the property out to Grover Landscaping & DPS Inc. (our company). and living out there on the base & kind of turning into our personal airpark. I think that dream will be coming true soon since we've just acquired our pilots license & purchased a plane." A February 2005 aerial photo by Jonathan Westerling looking southwest at the site of the former NAAS Vernalis. annotated to show the location of the former airfield. A November 15, 2009 aerial view looking north at the remains of Vernalis NAAS, taken by John Hollis from his powered parachute. 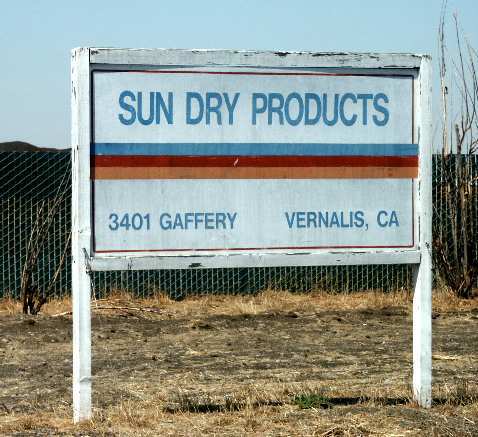 The site of Vernalis NAAS is located northeast of the intersection of Gaffery Road & Koster Road.